Happy Friday everyone! This has been a super busy week for me. My bridal shower is Sunday and I am definitely Â a last minute kind of gal! Speaking of procrastination, we moved into our new house in March and I am finally getting around to organizing my closet. 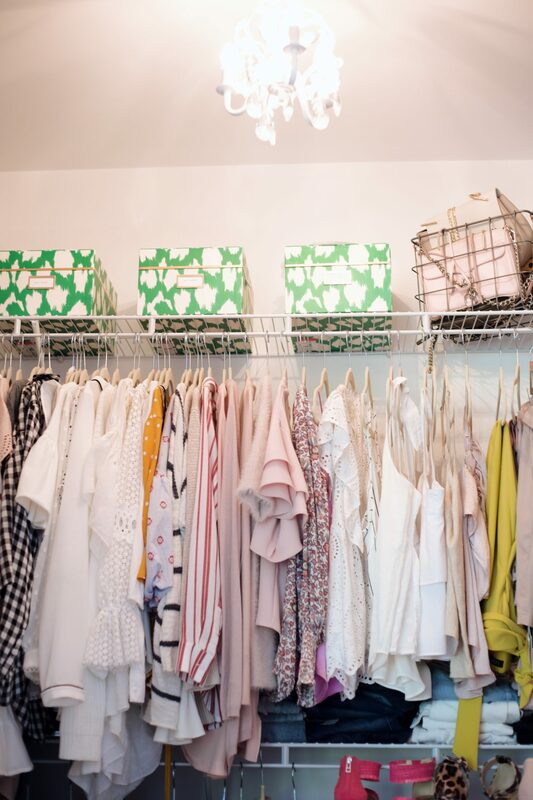 Today on the blog I am going to be talking all about my closet organization and decluttering for summer with Voot Boot Shapers. After moving from a condo with very little storage or closets, we are so happy to have this space. We have to install our new closet system over the summer but I wanted to share it now so you are able to see a before and after. I will say I love this space as it is but I know a new system would make this space complete! To organize my closet I started by cleaning and packing away all my winter boots. It was so nice to declutter and remove pieces that wouldn’t be getting used for a while. Whenever you store anything away it so important that it is cleaned and stored properly. I used a shoe brush to get rid of any dirt or salt that may have collected over the winter. Many of my boots are cut above the ankle or OTK so I used the Voot Boot Shapers in Prima. They are essential if you don’t want creases or dents when it comes time to pull these back out. After searching high and low for the best shoe storage I went with this Closet Maid system. I knew I wouldn’t be using it for long and it could easily be utilized in other areas of the house. Before I stored all my shoes in their original box. This made it hard for me to see my shoes as well as locate them, Wedges are HUGE this season and if you can’t tell I am loving them. They are super comfortable and give me a few extra inches. I also love that I could use the Voot Boot Shapers in Rodeo to help them keep their form. If you are a shoe collector like myself I can’t begin to stress how much I love Voot Boot Shapers. When I first received them last fall I was happy to give them a try (Blog post here). Fast forward to today and I don’t know why I hadn’t used them sooner. I can’t count how many pairs of boots and shoes I ruined from throwing them in a box under my bed without the shaper support. Farewell boots….wish I knew then, what I know now With so much on my plate with wedding planning, baby, and the new move it felt so good to finally have my closet ready for the warm weather. Brian and I are currently on the hunt for the best closet storage system. If you have one you love let me know in the comments below. I Can’t wait to show the overhaul in a few months as well as my home tour. Make sure you check out Voot Boot shapers and have an awesome weekend. 25-day wedding countdown!